I'm still working on upcycling/repurposing and selling my purchases from a midwinter rummage sale. This over-sized potato masher is my project for today. It cost me 75 cents. I washed up the potato masher and then treated the handle with Miss Mustard Seed's Hemp Oil. It darkens and protects the wood. I purchased this very small wooden sign at the thrift shop a couple days ago for 50 cents. I cut the wire off of the sign and painted one side with Decoart Chalky Finish Paint in Relic. The other side was painted with Annie Sloan Chalk Paint in Old White. 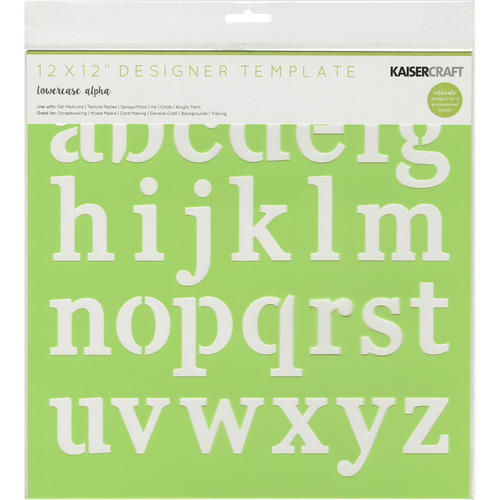 I found these 1" lowercase letter stencils at a local craft shop from Kaisercraft. 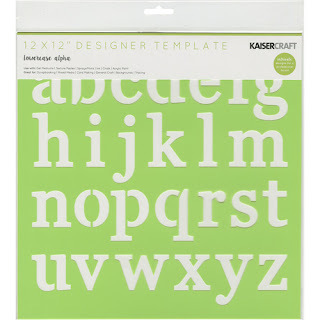 I find that cutting the stencil apart works best for me. I used this star stencil on the Relic side of my sign. I used the spatula from this stencil on the Old White side of my sign. 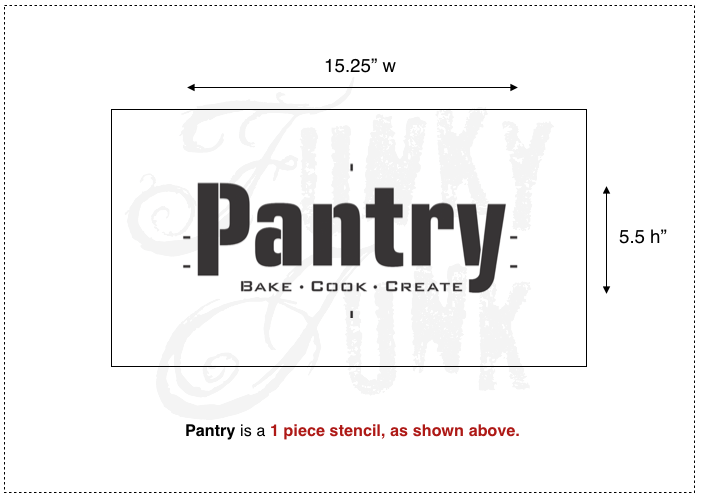 I used Bake, Cook, Create from *Old Sign Stencils - Pantry stencil. I screwed a 1 1/8" eye screw into the masher handle to hold my sign. I pulled the eye screw end apart a bit with a pliers, to make it into more of a hook. So here is side one Decoart Relic Chalky Finish Paint, a gray craft paint star with the stencil above, and eat stenciled in ivory craft paint with the lowercase letters from the Kaisercraft stencil above. The piece was distressed with sandpaper and sealed with Decoart Creme Wax. Here is side two, in Annie Sloan Chalk Paint in Old White, words from the Pantry stencil from Old Sign Stencils from above, spatula from the Handmade Charlotte kitchen stencils above. I replaced the sign's wire hanger with a jute string. 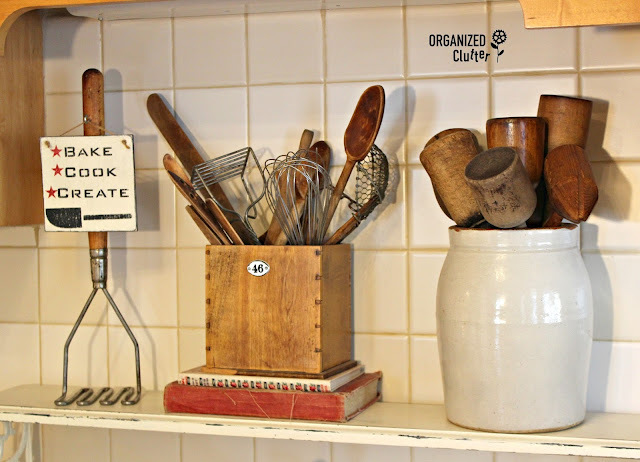 I love decorating my kitchen with vintage utensils and farmhouse style signs. This project uses both! It's cute and I love your farmhouse decor! I do think the masher is actually a drywall mud masher (which means always check out the tool section of a yard sale and/or thrift store for these treasures). It might be! I saw long handled potato mashers on the internet. I thought it was for a commercial sized pot. Thanks! Great ingenious ideas! Thanks for always sharing your talents. Oh my goodness... precious! I love your clever signs so perfectly themed with your 'sign stand'. Genius! 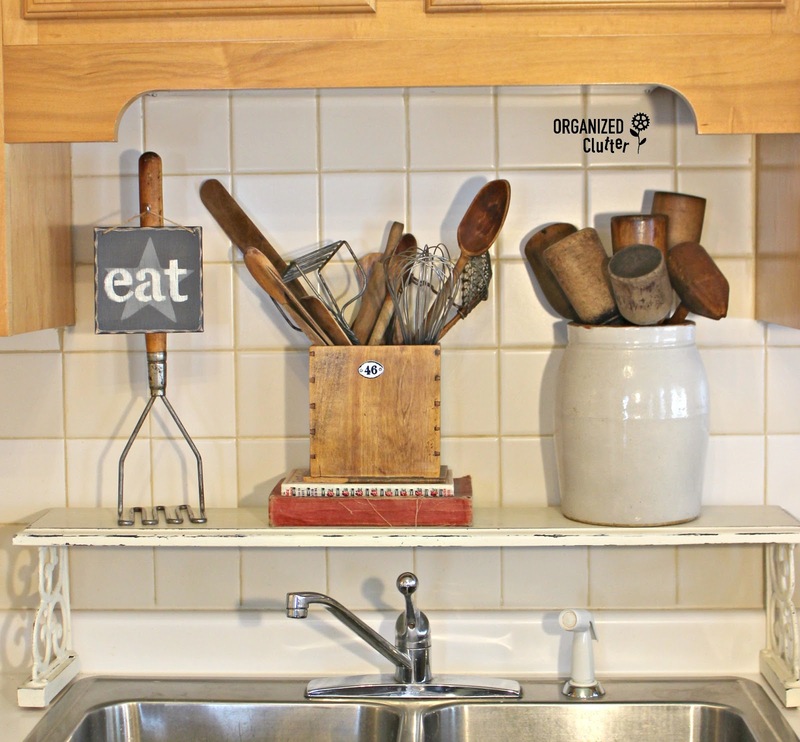 Carlene, I love that white shelf over your sink. Did you make it yourself? I think I need one! Me too...what Naomi says. Not that I don't love what you just created!